As part of our recession-proof income diversification, I've been leading a group of ecotourists around the area this week. 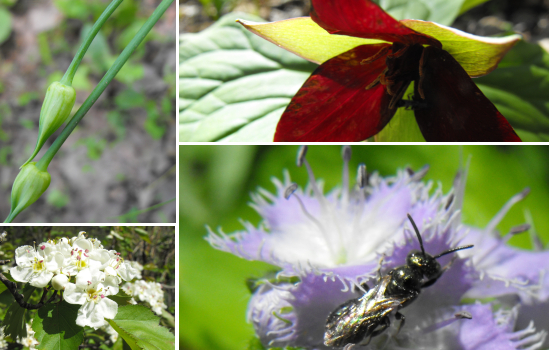 I've had a blast, getting paid to wander around in the woods identifying flowers. If I weren't such an introvert that I require an hour of decompression for each hour I spend in the company of people, I'd do this more often. How's it going with them? I'm still sorting through all the pictures of my hike with them, but I hope to have something typed up soon. Thanks for recommending me! I don't much care for dealing with people all the time either, but I figure there will be plenty of "alone time" during the winter months with our plan. We hope to get up some cabin rentals on the property by the end of our first year there. From the market research I've done on rental properties within 15 minutes of the Blue Ridge Parkway we can probably keep them rented out an average of 6 months out of the year at around $110 - $120 a night. So let's say it costs us $10-$20 in electric and upkeep per night - that's close to $18,000 per year on one rental unit! Another angle to try would be getting commission from local tourism outfits (horse rides, river rafting, etc.) for acting as an agent / concierge and sending your visitors to them. Just a thought. It's one more possible way to make a living on the homestead. Everett, I think your business model is a great idea! I wholeheartedly believe that ecotourism in our area is about to take off.